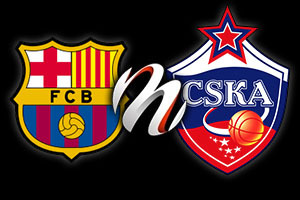 It may not have been the Sunday victory they were hoping for when they made their way to the Euroleague Final Four in Milan but Barcelona would have been delighted to defeat CSKA Moscow in the 3rd/4th Playoff match. In suffering the biggest defeat in Euroleague Final Four history, Barcelona had something to avenge and they found that they had a lot more desire for the match than their Russian opponents. Given the cruel late loss that the Moscow side suffered in their semi-final match, there was every chance that CSKA would struggle to find the motivation for this game. The players tried for their fans but the hunger and desire to make amends for the Friday night defeats was with the Catalan club. A 93 to 78 victory sounds comfortable enough and even though CSKA Moscow claimed the first quarter, Barcelona were in control for the rest of the evening. The scoring for the quarters panned out as 21-24, 29-23, 19-17 and 24-14. The second and fourth quarters were the ones that made the difference and these were the two that Barcelona powered away from their opponents. These play-off games are rarely the best of basketball games as it can be hard for the players to rouse themselves for the match after seeing their final dreams vanquished. However, for some players, there is a greater degree of freedom that comes with these matches, that allows them to deliver a strong level of performance. One player who enjoyed the game was Juan Carlos Navarro, who managed to write his name into the history books during the match. Navarro grabbed twenty points during the game including three 3 pointers from 5 attempts. This provided the player with the leading position with respect to three-pointers completed at the Final Four. Navarro now stands on 31 3-pointers, which is one ahead of JR Holden, the highly regarded CSKA Moscow player, who is retired on a total of 30 points. Navarro also moved himself up to the 4th position with respect to career scoring in the Final Four, with a total of 168 points. Other Barcelona player who stood up to task on Sunday included Maciej Lamp who managed to pick up 17 points. Joey Dorsey had an excellent game, delivering 9 points, 2 blocks and 12 rebounds whule Marcelinho GHuertas delivered 7 assists and 7 points. The leading players for CSKA Moscow were Sasha Kaun, who grabbed 13 points and Nenad Krstic, who picked up 11. During the early stages of the game, it looked as though CSKA Moscow were in a mood to blow away the blues of their semi-final defeat but in the end, the power and hunger of Barcelona told in the end. The win will not be able to erase the memory of the semi-final defeat for the Barcelona players and fans but there is no doubt that the Catalan club will be happy to end their season on a relative high with this win.